The first time I came across one of the Subspecies franchise movies was while channel surfing one evening in a hotel. I was on vacation and looking for something to keep me occupied in those just before sleep hours when I accidentally ran across Bloodstone: Subspecies II. It was the most horrible wonderful thing I had seen in years! 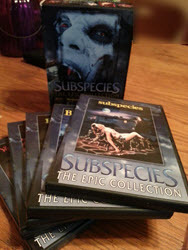 Since then I have watched all of the movies at one time or another (some more often than others), and this year I ran across a used copy of the Subspecies box collection while Christmas shopping. I resisted the impulse to buy then, but when I went back to the store after the holidays, it was still there, so Merry Christmas to me! The Subspecies the Epic Collection includes: Subspecies, Bloodstone: Subspecies II, Bloodlust: Subspecies III, Bloodstorm: Subspecies IV, and Vampire Journals (which is actually an offshoot of the series). more human looking vampire brother, has stuck around the family castle after his more monstrous brother, Radu, was banished. 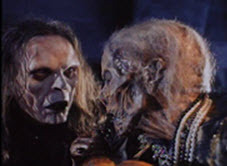 Radu turns back up, though, and kills their father (played by Angus Scrimm) in order to get the bloodstone and keep it for himself. Enter a few clueless archaeologists who are just hanging out in Budapest wanting to research old abandoned creepy ruins. There are three girls in the group, and Stephan tries to save them while Radu would prefer to snack on them. Hilarity, ahem, horror ensues. Most of the greatness of these movies surrounds Radu. 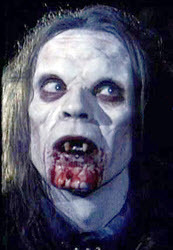 While many horror movies over the years have worked to humanize vampires, the Subspecies franchise has gone the opposite direction. Radu is a monster vampire without any redeeming qualities. He is horrific with a pale, deformed face showing signs of previous stabbings and violence. He has lank and strawlike hair, and is often – like, really often – slobbering blood. His hoarse, high voice is designed to cause anxiety and contribute to the overall disgust of his appearance. I am hard pressed to think of another vampire portrayed in the movies that is at this level of decrepitude. He is, however, a survivor! He has mad skills where speed and stealth are concerned, and he has the help of his mother’s blood (a witch) when it comes to manifesting demonic minions and casting a sentient shadow. “Vampire” names in the credits – since these were actually filmed in Budapest, many of the people in the credits have suitable names. For example, cinematography is by Vlad Paunescu and Production Design is by Radu Corciova. Radu’s awesomely creepy fingers – not only are they several inches longer than normal human fingers, but he can break those puppies off and the broken pieces turn into mini demon minions. Radu’s creepy, high voice – well done Anders Hove. The part where Radu is able to sprout lengthened blood vessels that reach out from his body to his decapitated head and pull it back onto his body. A skill that I’m guessing all vampires would enjoy possessing. The part where after stabbing his brother in the heart – which then gushes a fountain of blood – Radu proceeds to drink from the blood, just like you would from a water fountain. The creepy decrepit mommy of Radu – I’m guessing that she is possibly the sister of the Crypt Keeper – who works voodoo and can fly around the room. The Radu shadows. These are great when played up against the architecture of the Budapest streets, showing a huge, looming vampiric shadow that moves on its own. If you are looking for some fun with horror – where the vampires are more monstrous and less model pretty – I highly recommend this series!